The Grand Dine is an all-day dining restaurant located at the Ramada Plaza Hotel that is situated on the Delhi - Chandigarh Highway, Zirakpur. 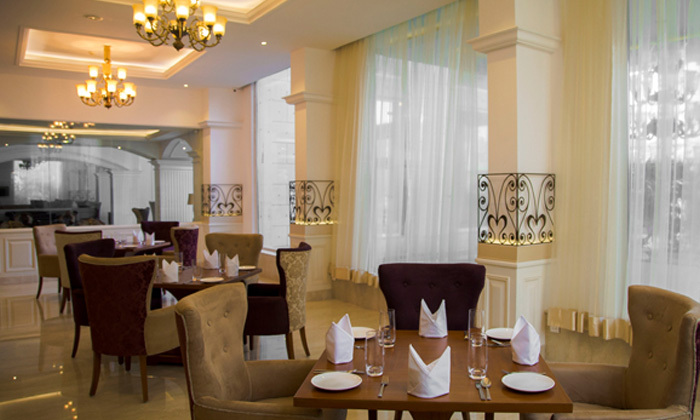 The restaurant serves an array of cuisines such as North Indian, South Indian, Chinese and Continental food in an elegant and well-designed dining area with nice bright lighting and comfortable seating options. The restaurant is open for breakfast lunch and dinner and serves some extensive buffets for dinner along with their A La Carte options. The restaurant also features a full stocked bar where guests can enjoy a variety of domestic and international spirits.